Slow down, take a seat, grab some pencils and as you spend time quietly colouring you'll soon see all God has done for you. Need time to reflect and focus? With ever-increasing pressures on our time and a perpetual stream of 'must-have' items advertised in the media, it's easy for all of us to overlook or fail to appreciate the people and things we already have in our lives. This book provides a chance for us to slow down and encourages us to develop an attitude of thankfulness. Packed with 30 inspiring quotes and beautiful designs, colour your way to calmness and contentment as you reflect on all the reasons to be thankful. Thankfulness: A Colouring Book by SPCK Publishing was published by SPCK Publishing in September 2016 and is our 14369th best seller. The ISBN for Thankfulness: A Colouring Book is 9780281077366. 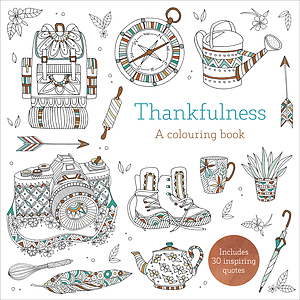 Be the first to review Thankfulness: A Colouring Book! Got a question? No problem! Just click here to ask us about Thankfulness: A Colouring Book. Is this book suitable for children of age 11 and upwards and are all the quotes from the Bible or does it draw on quotes from other sources, please? A:Yes, this is suitable for most ages. The some of the images are rather intricate, but are not made to be difficult. Not all the quotes are from the Bible. It draws on a historically wide number of sources for quotes. Thank you for using the Q&A Forum.